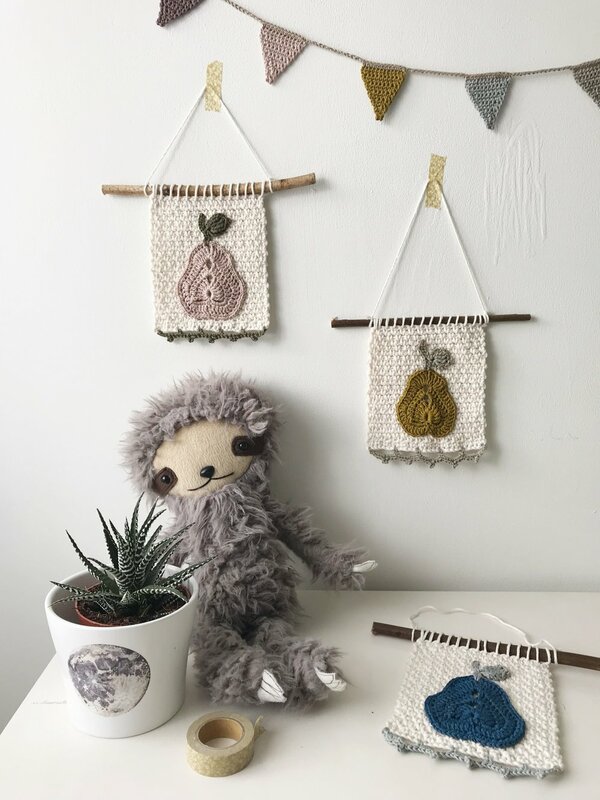 After taking up crochet as a hobby, Lois Floyd’s favourite pastime soon blossomed into a creative business, handmaking Scandi-inspired pieces for the home and nursery. Lois talks to us about her slow-living ethic, and juggling her business, Logii, with the demands of a young family, a day job, and home renovations. Hi Lois! How would you describe your work? 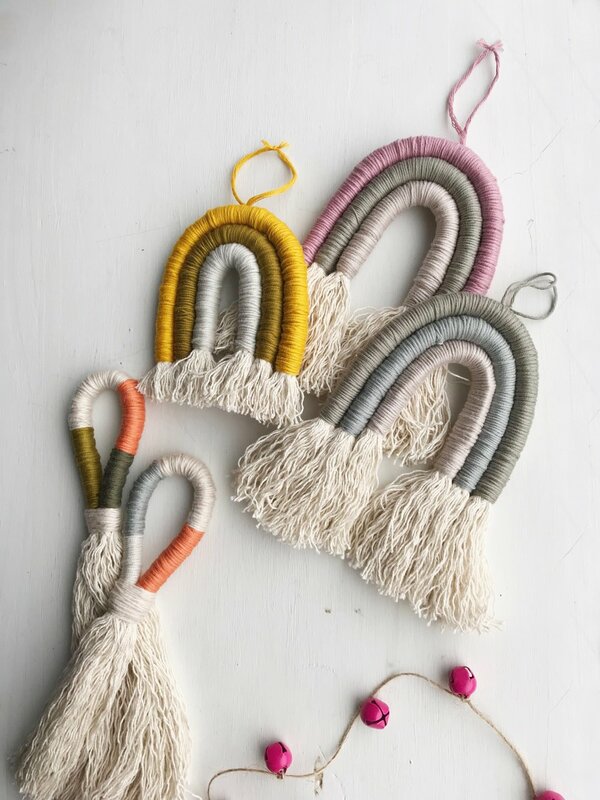 I make simple, Scandinavian-inspired home and nursery décor, handmade using natural fibres. What inspired you to set up your business? Crocheting used to be a hobby, and still is (when I find the time). 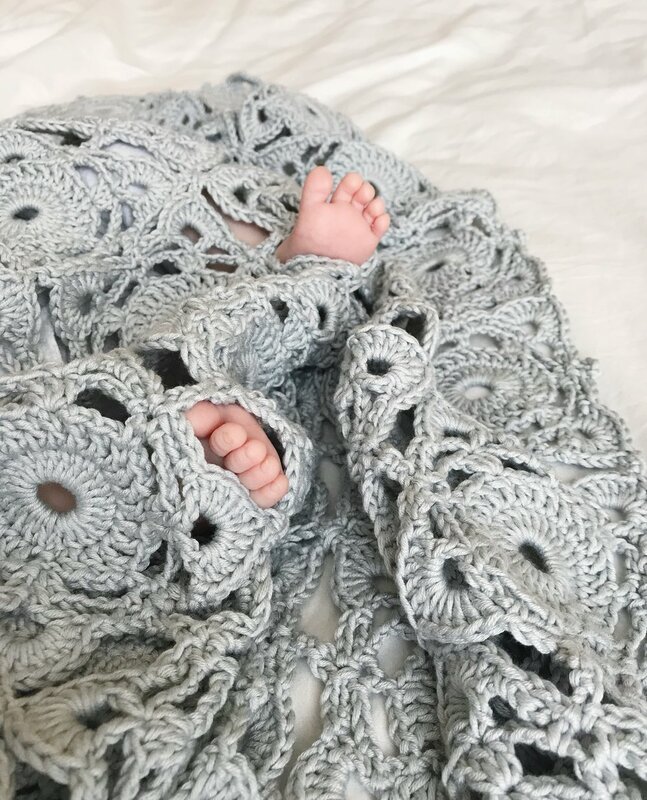 I had been making and crocheting for a few years before my little boy was born in 2015. During my maternity leave, I started making lots of little bits and pieces for him and his nursery. He was my main inspiration and the ideas were pouring out of me. It gave me the perfect excuse to buy more yarn! The first thing I had ever made, and the thing that had inspired me to learn to crochet in the first place, was a granny square blanket (which is still proudly draped at the end of his bed). What are the values underpinning your business? I love the whole 'buy less, buy better' ethos and hope this is somehow translated in my work. Everything is 'slow made', which I think makes it more special than any mass-produced item you can buy. I'm on a bit of a journey towards a more simple, natural lifestyle. I have felt overwhelmed in the past with the amount of stuff I've got (I'm a hoarder at heart), and having children only adds to this! With so much visual and mental 'noise', I wanted to strip back and be a bit more mindful of the things I was filling my home with. My business reflects this ethos, in that I try to keep the designs simple and always made with natural materials, as well as being conscious of our impact on the environment. I also want the pieces to be cherished and passed down through generations; I think there is something so special about handmade items that makes people enjoy and look after them in that way. I believe that the things you surround yourself with impact your life, and I want to help people create a calm and inspiring space for themselves and their little ones. What did you do before setting up your business? When I was younger I spent a few years studying art and photography, but ended up doing a degree in broadcast media. Since leaving university I've had a few different jobs, but after moving to Sheffield in 2010 I’ve worked in an office (which I still do part time). Crocheting is a very portable craft, so luckily, I can cram in a bit of crochet wherever I go. I rarely leave the house without my project bag! I have a sketchbook where I draw out designs or write garbled notes of patterns I'm making as I go. Often, I will find a new stitch or a pattern from Japanese crochet books that I will incorporate into my pieces. I use natural fibres, mostly cotton and merino wool. In the past I've been completely inspired by some beautiful yarn and just bought it without an idea of what it will be turned into. 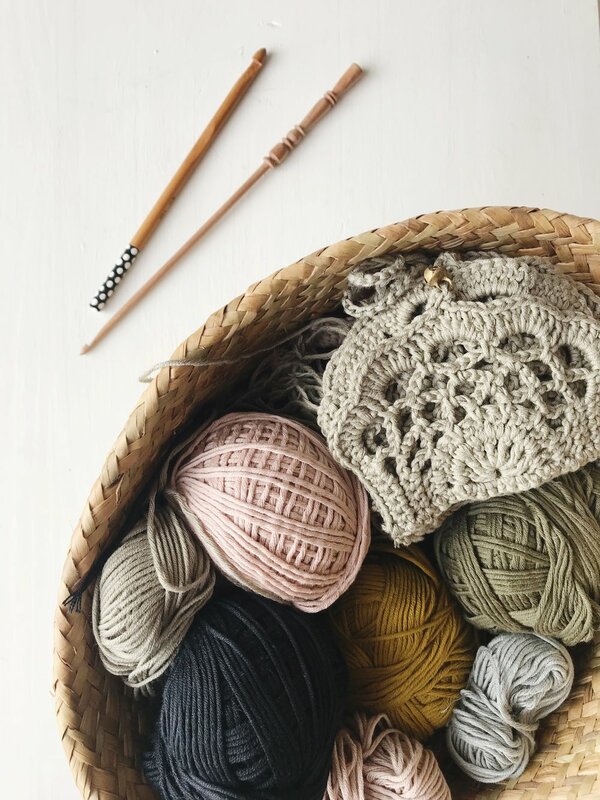 These days I tend to think of what I want to make before finding the right yarn to work with (but the temptation to buy new yarn is always there!). As I have two small children (one nearly four, the other ten months old), I do most of my work when they're asleep. My husband will help me out at weekends for a few hours if I need to take photos or get parcels ready; “the juggle” is real! Do you have a preferred workspace? I live in a small terraced house with an attic conversion, so I have claimed a section of the attic as my workspace. Up there is a desk and some shelves with all my materials, stock etc, but in reality, I do the majority of my work in the comfort of my bedroom or living room. I’m self-taught. 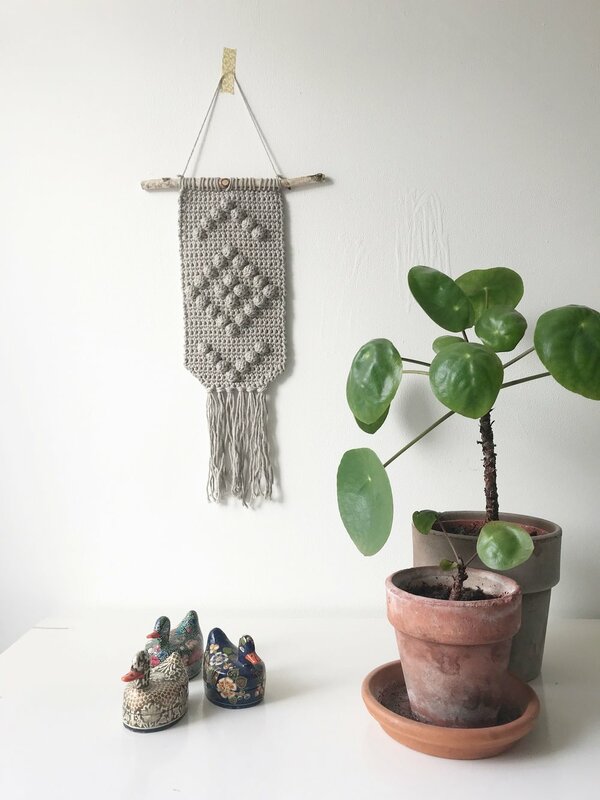 I learned to crochet through tutorials I found online and I'm still learning new things every day about running a small business. I do everything from the initial designs to the branding, marketing and of course, the making. How has your business evolved since you began? It has slowly developed over the years; I've tried out a few different products and designs and as I've learned more about pricing, branding, and also where my passion lies, I've adapted the business to grow with me. I first started out making lots of different things for my son Benjamin, such as bonnets and booties, so thought I'd try putting those out into the world as I was always getting complimented on them. I would buy yarn in sales and experiment with what to make with it. After moving into our new home in Sheffield (which is slowly being renovated), then going back to work and juggling motherhood, a small business and everything else, I soon became overwhelmed and stressed with the chaotic life I felt I was living. So, I gradually tried to simplify things wherever I could. Getting rid of the clutter that we no longer needed, changing my shopping habits and teaching myself more about simple, mindful living. As I learned more about the benefits of living a more natural lifestyle, I started making changes in my everyday life. I gradually changed my beauty products to all-natural ingredients, I replaced the cleaning products I use and I took notice of what my clothes were made of. 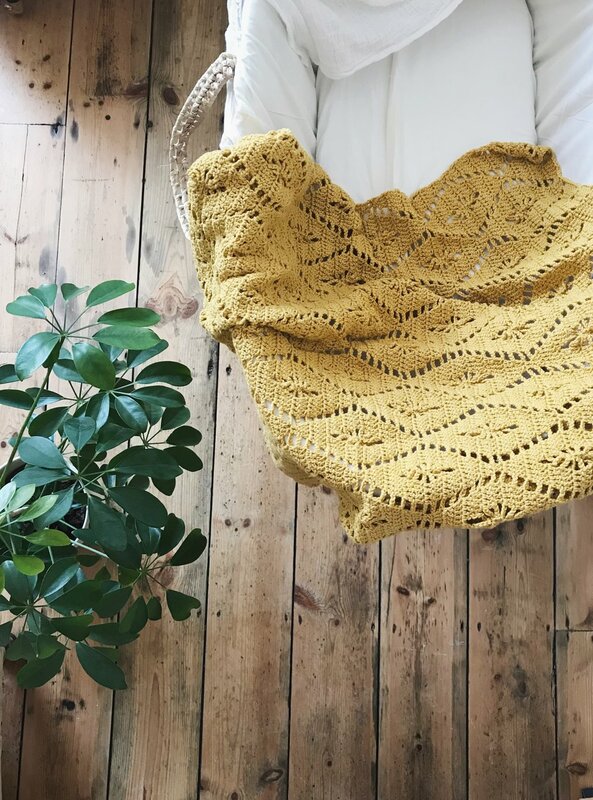 It was a natural progression for me to stop using synthetic yarns and I became more passionate about creating a positive, inspiring environment for myself at home, and in my business. Logii kind of naturally evolved to reflect this and I focused more on creating home decor. 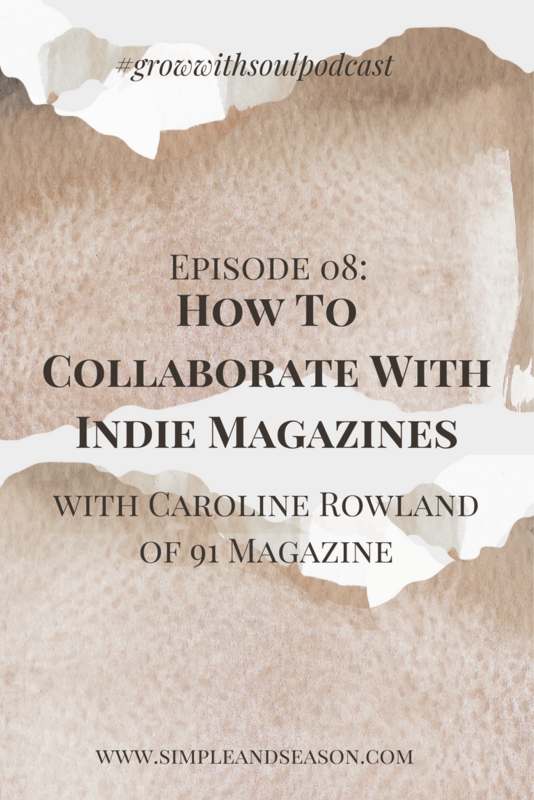 How do you balance producing handmade works with the online world? That's a very good question that I'm still working on! I wouldn't say I have the perfect balance yet and my online presence is the part that suffers if I'm really busy, but generally, I find the most efficient way of working is to batch tasks. I'm active most days on Instagram and Pinterest; I tend to reply to customers or DMs whilst I'm feeding or having cuddles with my baby (thank goodness for smartphones!) Most of the ‘making’ part will happen in the evenings when my children are asleep, or if I have a morning or afternoon to myself (which isn't too often). How important is the online community to your work? Oh massively! I've met some wonderful people through Instagram that I chat to regularly; from other mothers to other small business owners, and of course customers. 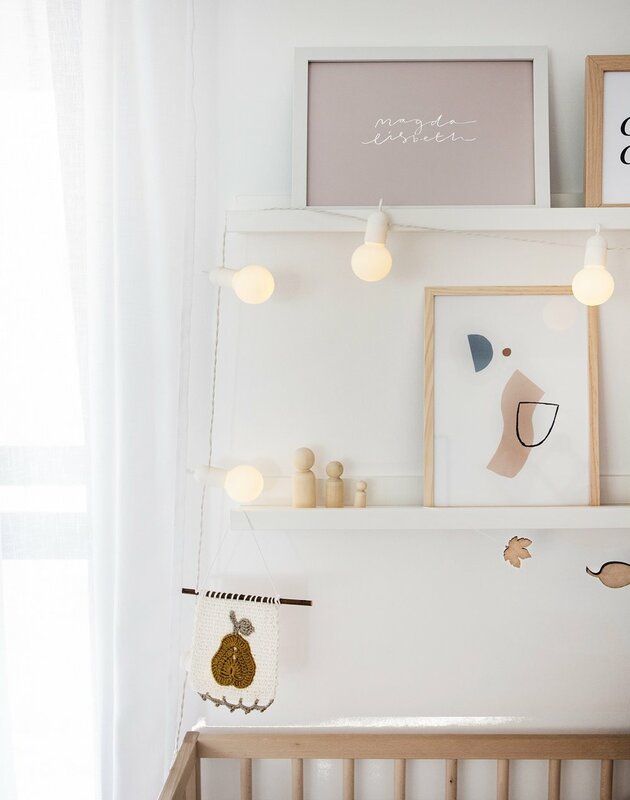 The majority of traffic to my online shop is from both Instagram and Pinterest, and it's helped me get noticed by some big accounts. It's also a huge source of inspiration! I'm often inspired by other types of craft or art. I love ceramics and painting, and can be very inspired by the different patterns, colours and textures I find in shops, cafes or magazines. 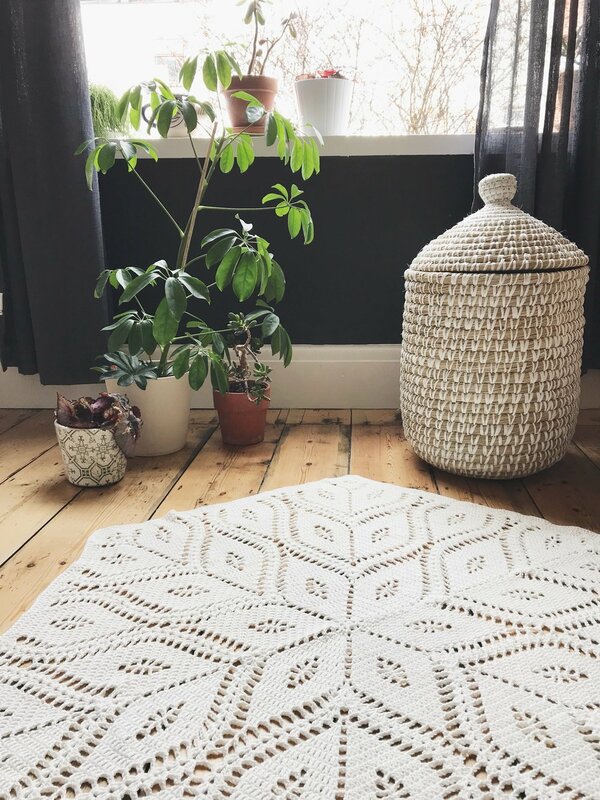 I love the brightness and simplicity of Scandinavian interiors, but am also drawn to bohemian decor; so I was thrilled to discover the whole Scandi-boho movement! What do you find are the joys of working as a maker, and what are the challenges? I love working as an independent maker; it's my main creative outlet and I get so much joy and peace from crocheting. I also love the community I have found through social media and the real connections I have made through it. It's such a positive experience and has made me grow in confidence and encouraged me to push myself in ways I wouldn't have done otherwise. It makes my day when I get a happy email from a customer, or get tagged in a photo featuring something from my shop. It's true what they say about small business owners doing a happy dance! That being said, I do get frustrated by the little amount of time I feel I have to do 'all of the things', but actually, it has pushed me to adapt and focus on what's important. I find it hard to switch off sometimes. Trying to get the balance right is something I'm still working on, but I'm happy with growing slowly as I enjoy my young family. Which pieces do you most enjoy creating? It has always been blankets for me. 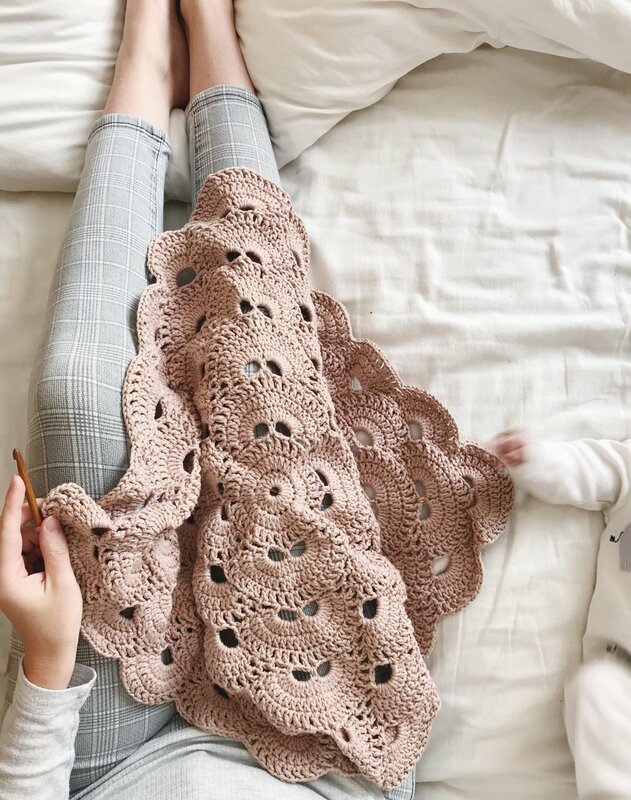 The reason I first taught myself to crochet was because I saw a photo online of a beautiful crocheted blanket, and just had to know how to make one myself. 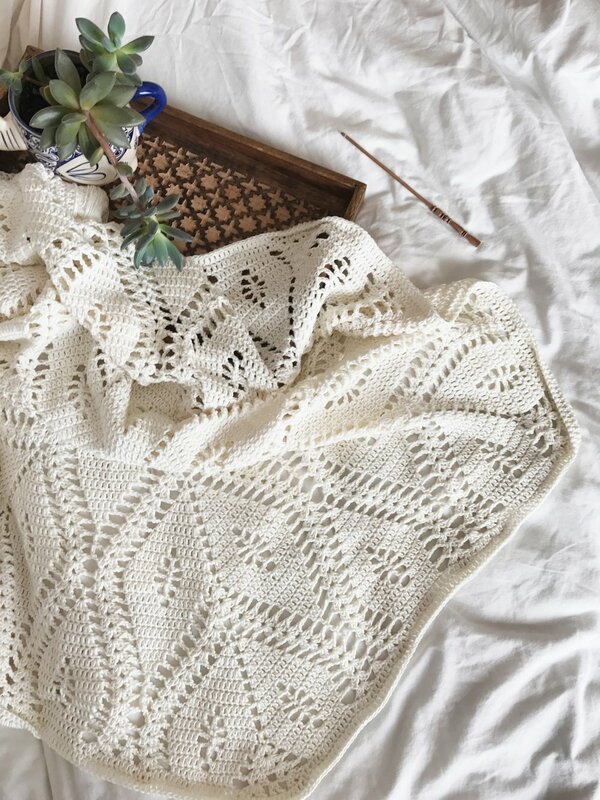 I find it is very meditative when I get stuck in to making a blanket, and the end results are always worth the time and energy for me. There are endless possibilities too, and I can spend hours deciding on stitches, patterns and materials for my next blanket. I'm slightly obsessed. Is there a typical working day for you? Each day is different, and I have my two little ones to occupy me most days, so I fit my work around them, really. Sometimes I'll take a trip out with them via the post office. Other days I'll catch up with work when my eldest is at nursery and my youngest naps. A lot happens in those in-between times and stolen moments. I can do many things on my phone: order supplies, respond to messages, edit photos, update listings. It's not that structured, but I can get a lot done if I have a clear list of jobs and priorities at the start of each week. In the evening, I try to spend time away from the computer or my phone (not always that easy or possible, but it's something I hope to get better at! ), and relax into the process of making. I try to make it an enjoyable and peaceful part of my day; I put on some music or a podcast, light a candle or turn on my essential oil diffuser, and make myself comfortable whilst I work on orders or new designs. How do you approach marketing and PR? The majority of my marketing is done via Instagram and Pinterest, and I've recently started a blog as well. I've taken part in a few product swaps with other makers, which is always fun and helps get your products in front of a new audience. What have been your business highlights so far? Some stand-out moments for me have been when I've been approached by people and brands that I admire who want to collaborate with me or buy my products; I still can't believe it sometimes. But then, I'll never forget the feeling of selling my first blanket - that was an amazing moment. Currently it's only for sale in my Etsy shop online, but I am working on a web shop that will be available via my blog (hopefully in the near future). What does the next year hold for you and Logii? 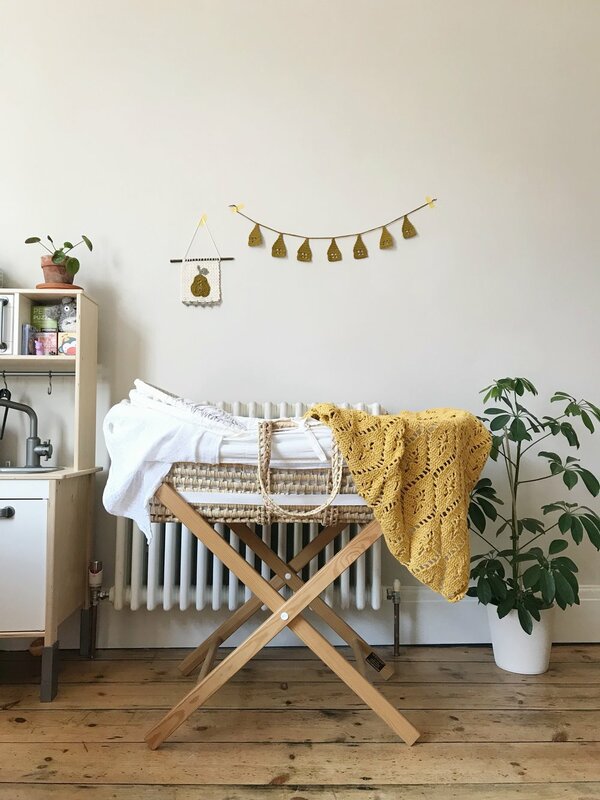 It's a bit of an unpredictable ride as I'm still on maternity leave and we're slowly renovating our house, but business-wise - I've just launched my blog, so I’ll be blogging regularly, and I have a range of new blankets and wall decor in my shop. Hopefully I’ll be attending some more craft fairs, and I wouldn't mind running workshops, so perhaps I'll give that a go - who knows? What are your creative pastimes and hobbies? When I get time, I love to try out other fibre arts such as weaving, knitting, macrame or more recently punch-needling. I've usually got a personal crochet project on the go too - I make clothes for my children or presents for friends. We have an allotment, which also requires a lot of attention, so my husband has taken charge down there; but when the weather is nice, we all go down and help out. Any advice to share with makers just starting out? I'd say do the best with what you have and don't let perfectionism stand in your way; you get better in everything with practice. Spend time finding and connecting with the people that are going to support you, and don't worry if it doesn't all happen overnight (and yay! for you if it does!). Cup of tea at the ready, radio/music/podcast on, some essential oils on the go and get comfortable. Tea (but I need one strong coffee in the morning to wake me up!). Night owl trying to be an early bird. That procrastination takes many forms, and really, you just need to get on and do the work!